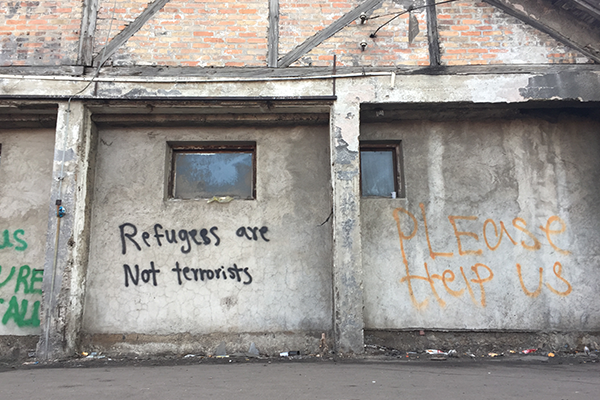 Belgrade, Serbia – In a trash-filled area of dilapidated buildings known as the “barracks” along the train tracks of Belgrade’s central train station, where large rats scurry around and medics boil water in a pot over an outdoor fire, discussions revolve around the latest rumors—about the policies of Hungary’s Fidesz government. Most of the barracks’ residents have already attempted to cross the border into Hungary, many several times. All of them have been pushed back, and describe brutal beatings by Hungarian police personnel. In a small medical tent, a young female medic was tending to an Afghan refugee. He showed her his deeply swollen leg—a Hungarian policeman beat him with a baton. “I see about 15-20 patients a week who suffer from injuries they say are the result of police violence,” said the medic. 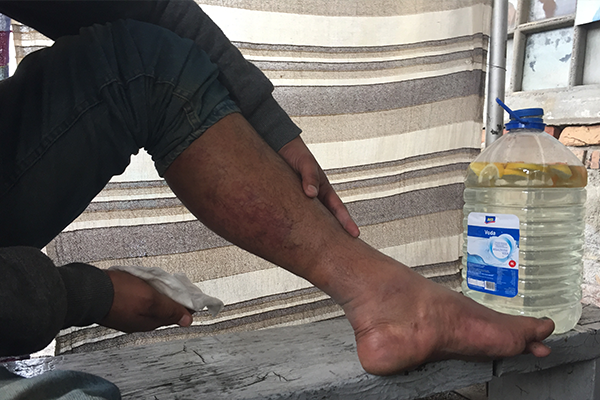 Doctors treating refugees returning from the Hungarian border are growing increasingly alarmed at the injuries they are seeing and the reported brutality of the Hungarian police. 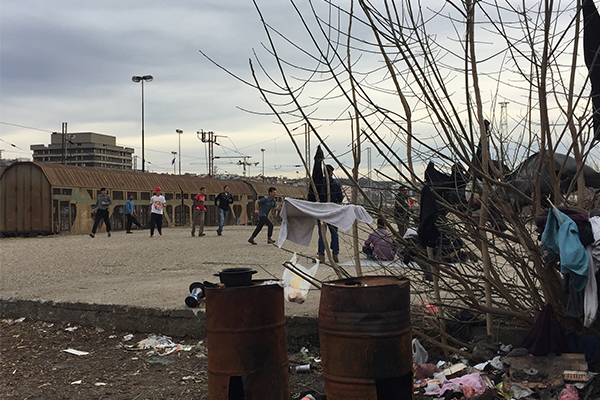 “Yesterday we had two Syrians who were beaten so badly they had to be hospitalized,” said Andrea Contenta, Humanitarian Affairs Officer at Doctors Without Borders Serbia (MSF). Since the beginning of 2017, the MSF clinic in Belgrade alone treated 24 people for injuries they say resulted from Hungarian police abuse. 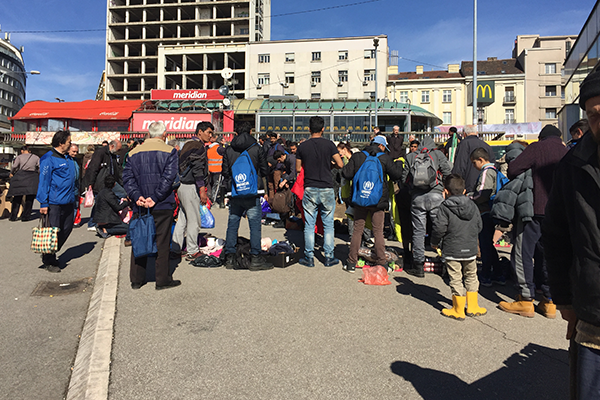 Asylum-seekers in Belgrade sporting UNHCR backpacks. 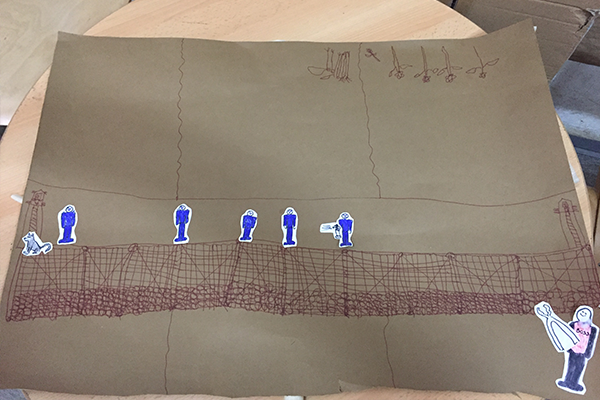 Since the summer of 2016, when reports of violence began emerging, refugees attempting to enter Hungary generally describe similar experiences: walking in groups, they cut through Hungary’s razor-wire fence and attempt to make their way to Austria. However, they quickly meet Hungarian police, who–according to hundreds of reports made to human rights organizations, medical personnel, and journalists on the ground—set dogs on them, beat them with sticks and batons, kick them, and engage in humiliating behavior, including stripping refugees of their clothes and making them lay on the ground at times for hours. Refugees carry both physical and emotional scars from their experiences attempting to enter Hungary. “I just saw him disappear beneath the ice,” said one refugee in the barracks, describing watching a fellow refugee drown. Local and international watchdogs have repeatedly appealed to the Hungarian government regarding the reported violence. In July 2016, the Hungarian government introduced a law that formally allows police to “push-back” refugees who are within 8 kilometers of the border back to Serbia, without allowing them an opportunity to request asylum. Those caught by the Hungarian police are often reportedly beaten or set on by police dogs, requiring them to seek medical treatment. “Push-backs are not the solution, the problem should be dealt with systematically and legally,” said Mirjana Milenkovski, Press Officer at the United Nations High Commissioner for Refugees (UNHCR) Representation in Serbia. The UNHCR collects testimonies from refugees who experience violence, but thus far has opted not to make the material available to the public. Many refugees who report experiencing violence at the hands of the Hungarian police are minors. Unlike the UNHCR, Save the Children is willing to share some testimonies of Hungarian police brutality. One document describes the experiences of two 13-year-olds, Egbal and Muzafar—childhood friends from a small village in northern Afghanistan who made their way to the Hungarian border. Egbal’s father died, leaving him to support his younger siblings in Afghanistan. Muzafar had lost both his parents and has an older brother already living in Germany. Some Hungarians are not hiding their disdain for the rights of refugees: Jobbik vice-president László Toroczkai often posts photos of refugees his villages’ civilian guards catch along the border on his facebook page. The photos often show refugees in uncomfortable physical positions. Now, rumors are circulating among refugees and aid workers that Hungary’s government is preparing to stop allowing any refugees to request asylum in the country. Currently, the government allows 50 people per week to enter the transit zone on the border and formally ask for asylum. Serbia used to be a transit country. But with the near-closure of the Hungarian border and the violent Hungarian push-backs into Serbia, many refugees find themselves in limbo. 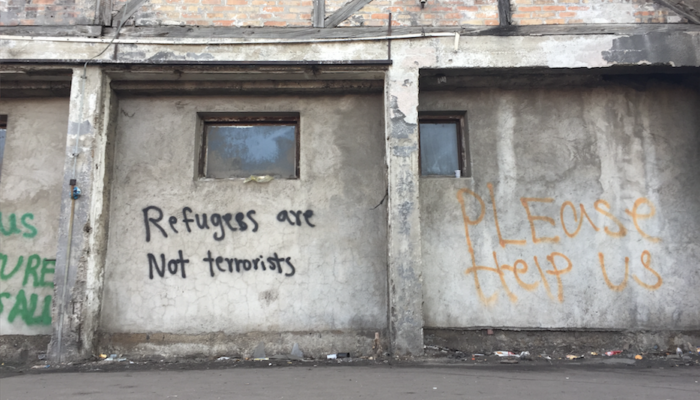 “The situation has become tougher,” said Felix Thomson, Distribution Coordinator at Refugee Aid Serbia, an NGO that works with refugees in Belgrade. “Serbia is a transit country in people’s minds but travel is now much harder,” he said. Refugees keep attempting to cross to Hungary but most are in effect stuck in Serbia. “The 8-kilometer rule has become a turning point. Before I was seeing different faces, now I’m seeing the same refugees—some of them I know now for six months,” he said. The Hungarian government’s efforts to limit legal avenues to enter Hungary have empowered smugglers, who have a strong presence in Belgrade, and in particular in the barracks. “Single men have no chance of entering Hungary legally, they must rely on smugglers,” said Ristic of Save the Children. “Closing the border gave smugglers more power,” she added. It remains unclear how the construction of a second fence and plans to expand the 8-kilometer rule to the entire country will impact refugees. The Hungarian government has refused to acknowledge that Hungarian police personnel are engaging in widespread human rights violations. Minister of Justice László Trócsányi visited the Röszke transit zone on March 3 and emphasized the government’s stance. “Hungary is complying fully with its international obligations,” he claims.